← Is the future of Virtual Reality alluring or terrifying? How Iraninas start dating, falling in love, and getting married? How much families are important in these issues? Marriage is one of the most important issues that happens for most of the people in the world and probably is the most important one! Based on differences in cultures, histories, religions, societies and so on, the ways people start dating, fall in love, and marry differ in the countries all over the world. Also, the ways people celebrate marriage ceremonies are dissimilar in the countries based on those differences. Being in an English learning for international students class, I think (hope!) it would be interesting for the students as well as my teacher with dissimilar background to know that how Iranians start dating, falling in love, and getting married. How Iranians start dating, and falling in love? The way people start dating in Iran is highly dependent on the family they were born. Generally, we have two extreme categories for Iranian families. The fist category are ‘religions’ families who believed that their sons or daughters should not have any relationships before marriage. Sometimes this category also is refereed to as ‘traditional’ family. Having this attitude in mind, a probable question coming to mind is that so how boys and girls in religions families meet each other for the first time while they should not have any relationships before marriage? To answer this question I should explain a custom which we called ‘Khastegari’. ‘Khastegari’ is a custom in which families of both girl and boy come to meet each other for the first time with or without knowing each other before and this time could be the first time the the boy and the girl meet each other. In this meeting, families as well as the boy and the girl talk to each for about 4-5 hours to get to know each other. Also, another custom that families talk about in ‘khastegari’ called as ‘Mehrieh’. ‘Mehrieh’ is an amount of money, usually a big money more than $100000 that if the couple divorced, the guy should give to his wife. It is really Ridiculous!!!!! is not it? After this meeting, if the families especially the boy and girl want to know each other more, a period starts we called ‘Namzadi’. In this period, the couple is officially in the relationship and try to know more each other. In this period the couple either falls in love with each other and decides to get married or understands they cannot get along with each other and break up. The second category are those families we called ‘open-minded’ or ‘modern’ families. I think you are more familiar with these families than the previous category. These families allow their children to have relationships before they want to get married. The ways boys/girls in open-minded families start dating and meeting each other is more or less similar to here, US. They meet each other in parties, friends’ groups, universities, etc. and they continue dating until they falling in love with each other and getting married or break up the relationships and start another one. In these families, once a boy and a girl fall in love, they will still have ‘Khstegari’ and ‘Namzadi’ customs. For this category, ‘Khasteegari’ is just a formal request for marriage which is usually from the guy’s family. Conversely, for those religious families, ‘Khstegari’ is a formal request for starting a relationship. Also ‘Namzadi’ for the couple with open-minded families is usually shorter in comparison with the first category as the couple already know each other and fell in love with each other. Although as a person who has grown up in an open-minded family, most of the Iranians I have seen and interacted with were belonged to the second category, the number of people who belonged to the first category is significant enough to be taken into account. It should be mentioned that most of the Iranians do fit in one these categories, however, there are many other families who were traditional but are moving toward being considered as a modern families. This situation mostly occurs when parents have traditional thoughts but the children do not want to follow what they parents tell. Such families are really difficult to interact with as they are in a transient state and even do not know how they should treat. The boys and girls in such families are the biggest victims in many situations especially for having serious relationships, dating, falling in love, and getting married. In these families, the way that boys and girls start dating or have relationships before the marriage is exactly similar to the boys and girls belonged to the modern families with one big difference and this difference is that usually one or both parents are not aware of these relationships. Further, concealing these relationships is not the only problem in these families. Another problem rises when the families decide to force their children to marry in a traditional way while these boys and girls have their own relationships and want to get marry in a different way with different person. Anyway, Once the children in these families want/forced to get married either in a traditional or modern way, they will still have ‘Khastegari’ and ‘Namzadi’ and these two customs are done usually in a way similar to the traditional families rather than modern families. After that the couple falls in love and decides to get married, they should celebrate their marriage ceremony. We have two steps for this ceremony. The first step is called ‘Patakhti’. In the ‘Patakhti’ ceremony usually the couple just invites the close people like close friends, brothers, sisters, their families, etc. In this ceremony the guests should give their gifts to the couple which usually are really worth a fortune. During this ceremony, the guests and the couple dance together and have a lot of fun and usually the ceremony end up with a dinner. The second step is marriage ceremony. In this ceremony, the couple invites almost all of their families for the ceremony and guests give their valuable gifts to the couple. The rest of the ceremony is pretty similar to the ‘Patakhti’ with a big difference that the ceremony is held in a big place. The way that the couple celebrate their marriage is also highly dependent on their families. These customs are almost the same for both traditional and modern families with one big difference. If the couple comes from a traditional families, the ceremony will be held in a place that men and women are separated. In the other words, all men go to one place and at the same night all women go to another place and men and women celebrate the marriage ceremony separately, But for the modern families these customs are normal and all people go to one place to celebrate the marriage ceremony. After the marriage ceremony the couple usually goes to a trip on their honeymoon and then start their new life. How these customs differ from your customs? 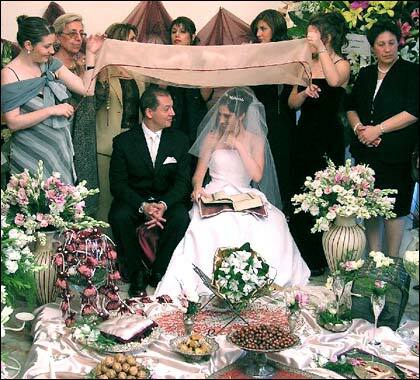 Do the Iranian couples really get married or it is better to say that their families are getting married? Did you get shocked once you read this article? share your shock, ideas, and customs !!! Have you ever wished to be called another name? Do names affect your personality or life? Is the future of Virtual Reality alluring or terrifying?